6. Which Galley Sink Spigot Does What? The Automatic Identification System uses a transponder to transmit and receive detailed information about your ship and other equipped with the system. Not all vessels have AIS onboard, but it is a valuable supplement to radar and visual observations. You can find the manual for Celtic Song's AIS HERE. The boat has a number of thru hull openings. You should be familiar with their locations. You can find a diagram HERE. The motoring range of Celtic Song depends on a few factors: speed, wave height and current. Its two tanks hold 87 gallons, 67 in the main tank, 20 in the secondary. You can never actually use all that fuel so be conservative in estimating range. This GUIDE provides a way to consider fuel range possibilities. It's best when motoring to keep track of rpm, engine hours and distance logged. Here are some of the tasks required before getting underway for one of the excursions as well as what to do when you return to home port. 1. Refrigerator water clean out. Pump is a hand-operated up- and-down pump located inside cabinet on left side below sink, entered from galley side. 2. Vent (which also serves as overflow) for amidships stainless steel water tank, the smallest tank. When running the water-maker to the amidships tank and no other, this is where water will come out when that tank is full. 3. Salt water. Foot pump that brings in salt water used to wash dishes before rinsing with fresh water. 4. Fresh water faucet delivers pressurized hot and cold water using an electric pump. 5. Fresh water. Foot pump. If the valve controlling this foot pump is closed, using force will destroy it. Foot pedal should move easily. If it doesn’t, valve is closed. You can test water after the water maker cycles. Valve is located at the upper left side, forward part of cabinet on the amidships side. Water will come out of spigot No. 5. Turn the lever back up after testing. (See photo below). ​When the fresh water foot pump valve is open and the electric pump is on, there is a risk of pressurized water flowing back through the foot pump. That could lead to a loss of water and a burned out electric pump. CLOSE MANUAL VALVE WHEN THE BOAT IS LEFT UNATTENDED. Aft cabin is private. Good for one person or tight for a couple. Celtic Song's head is a good, reliable toilet. Treat it well, and it will be trouble free. Nothing goes into the head that hasn't been inside your body with the exception of small amounts of marine grade toilet paper. The attached document describes some routine maintenance as well as schematics when things go wrong. 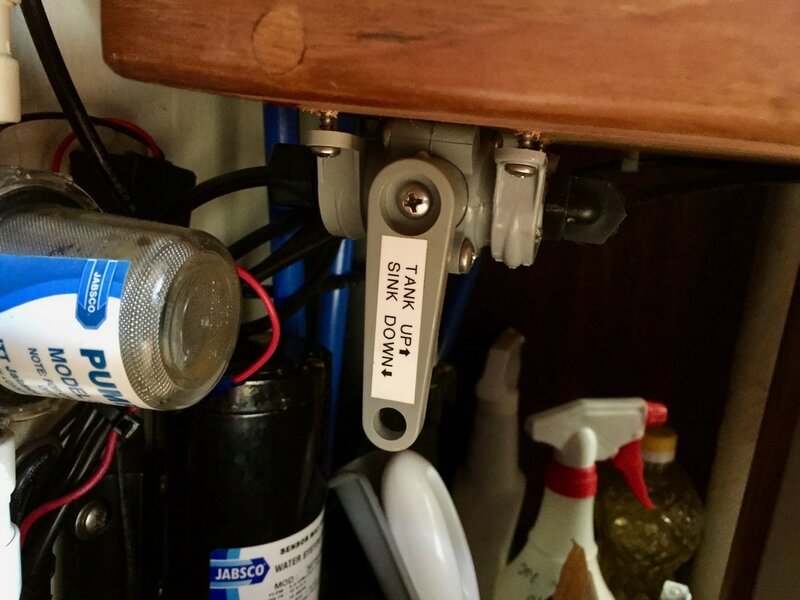 One system that distinguishes Celtic Song as a bluewater cruising boat is her ability to turn saltwater into fresh, clean drinkable water at the rate of 13 gallons an hour. This manual describes its operation. (CELTIC SONG) Tow Boat US, Tow Boat US, Tow Boat US. this is Celtic Song, Celtic Song, Celtic Song. OVER. Channel 72, 72 OVER. (or some other designated working channel). (CELTIC SONG) Switching to Channel 72, OVER. Both Jean Moran and Karla Reinhardt sent along information about California's new boater safety requirement. The following is from the BoatUS Foundation website on how to meet this requirement. Starting January 1, 2018, California boaters ages 20 or younger who operate a motorized vessel on state waterways will need to have a boater safety card showing successful completion of a boater safety education course. Each year thereafter on January 1, more age groups will be added to the requirement so that by 2025 all California boaters will need to carry a boater card issued by California State Parks Division of Boating and Waterways (DBW). ​The BoatUS Foundation has launched a free online Boating Safety Course that is now approved by DBW. Once successfully completed, the course does not expire so boaters of all ages don’t need to delay and can complete their boating safety education now. Click HERE for more information and to get to the test.